The chemical melamine was found in the milk protein lactoferrin produced in New Zealand, the Korea Food and Drug Administration (KFDA) said Wednesday. This is the first time such a substance was found in imported foods from countries other than China. The food authority said that it had found two instances of melamine contamination at the level of two parts per million (ppm) in the product used in baby food and powdered milk. The KFDA said it had not detected any melamine in food and milk made from the protein, but the government banned the import of all foods containing lactoferrin. Tests were performed after New Zealand media reported that lactoferrin for export had been found to contain the contaminant. 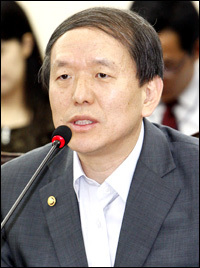 In the meantime, the major opposition Democratic Party called for the resignation of the commissioner of the KFDA for his alleged failure to prevent imports of melamine-tainted Chinese foods into Korea. The party said in a statement that KFDA Commissioner Yun Yeo-pyo should be held responsible for his lax oversight of the food safety which is vital for the health of the people. It also decided to introduce a revision bill on the food safety law to introduce a class action suit against producers of harmful foods. In the meantime, the government plans to ban imports of foods from foreign companies found to have produced foods tainted with harmful substances including melamine. It has decided to submit a revision bill on food sanitation law in order to strengthen regulations on food imports, according to the KFDA. The plan came after the harmful chemical melamine was detected in more foods both here and overseas. According to the plan, importers will be banned from importing products from foreign food makers, which are found to have used harmful substances. The substances will include melamine, carcinogens such as malachite green, and antibiotics including nitrofuran. The current law only imposes administrative actions against importers, such as a suspension of business for a preset period, fines, or inspections on their products for a certain period after the detection. The revision bill proposes that if the importers want to resume trade, they will have to submit to the health authorities written reports about how the foods contained the harmful substances and written confirmation about how the food makers have improved the production process, after receiving the documents from the foreign companies. The bill would also allow the authorities to inspect foreign firms to confirm the improvement. The government will present the bill to the National Assembly during a plenary session this fall. Another bill on food sanitation was proposed earlier which seeks more tightened rules on allowing businesses to import food products. Currently, those wanting to import foods only need to report the business to the authorities. More than 20,000 food importers are currently doing business here. ``Numerous small companies import food at low prices to win competition, and it results in a high chance that they import substandard and harmful foods. As these small companies also do not have organized distribution systems, it is not easy to recall faulty products,'' a KFDA official said.